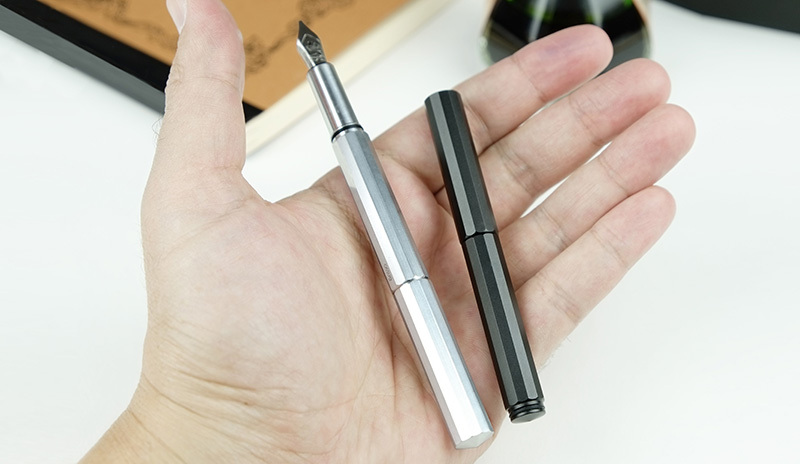 Ensso, the Los Angeles-based team behind past successful pen Kickstarter projects such as the Pen UNO and the PIUMA Super Minimal fountain pen, have launched a new product: the XS Pocket Fountain Pen. This pen will be available in four styles: black aluminum, silver aluminum, raw aluminum, and raw brass, and the faceted, more compact size represents a departure from their previous designs. The XS is a fountain pen designed with mobility in mind. It is a super compact writing instrument that grows into a regular size pen when the cap is placed on its back. When closed, it is one of the smallest fountain pens in the world which makes it ideal for everyday carry (EDC). The cap is secured by o-rings that allow a super fast uncapping for quickly writing down your ideas. The project is already funded nearly ten times over, so it looks like this one will be a success as well. Rewards start at $39 for an Early Bird, so the price of entry is low. If you're interested, check out the details over at the project page. Disclaimer: This post contains paid advertisements and/or sponsored content.